Your Vote Matters. Really, it Does. Every presidential election seems to be hailed as the “most important election of our lifetime.” But with Supreme Court appointments at stake, bad trade deals in the balance and collective bargaining rights under attack, this year’s election lives up to that distinction. November 8 is just around the corner and you need to make sure you’re ready. 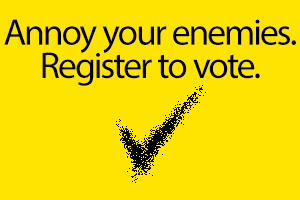 Visit RocktheVote.com to check your registration status. If you’ve moved since the last time you voted, you can update your registration. You can avoid the long lines at your polling place by voting ahead of time. Early voting is an easy and convenient way to cast your ballot if your state allows it. If you know you won’t be in town on Election Day, make sure you vote early or get an absentee ballot. Visit the National Conference of State Legislatures website for a complete list of states that allow early voting, absentee voting and mail voting.